Pep Guardiola hopes Sergio Aguero has not suffered a serious injury. 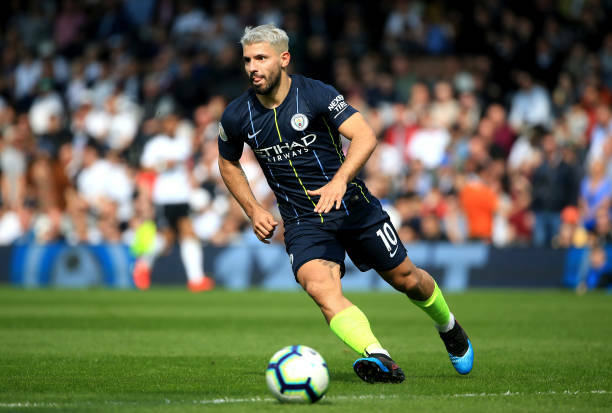 The Manchester City striker limped off early in the second half as City returned to the top of the Premier League with a 2-0 win. Aguero scored his side's second goal after Bernardo Silva fired the opener at Craven Cottage before he was replaced by Gabriel Jesus. "He says he felt something, but hopefully he's not injured," said Guardiola. "He decided on not continuing. Hopefully it will not be a big issue. "We'll see tomorrow, maybe the day after tomorrow." City have now won 11 of their last 12 and Guardiola insists they must win their last seven matches to hold off Liverpool. "Seven games left for the Premier League, and it's easy: we have to win every game to be champions. "We have a tough, tough opponent. But that's the challenge. "It was a tricky game for us after the international break. "But the way we started was amazing, the players surprised me again. "And we showed how focused we are to try to do our best. "After that the game was a bit more controlled. The game was under control, that is the truth. After the international break, people were tired, so I'm pretty sure in the next game our players will be a bit better. So we're just focusing on Cardiff now."